Heads Up, More Debt Coming YTour Way! We already know that they don't need an income tax to pay for Rumpke. They have money enough already to pay for the better part of next year and all they have to do is put up another levy and we would all most likely passed it. There really has to be something else. Maybe it's this. Hidden under zoning on their web site are utopian plans to destroy old Amelia and replace it with some dreamland empire right out of a science fiction movie! There will be more information on this web site concerning Utopia Amelia in the very near future. But I just 'gotta' tell you this right now. They actually plan to expand Main Street NOT TO HELP TRAFFIC BUT TO PUT IN A TREE LANE! Can you believe it!!! You don't have to believe me just take a look. Click on it to expand it to full size. Now I can't say I fully understand all this because the heading "Local Match" says only 25%. I assume that local match means us, Amelia Village. But who picks up the tab for the other 75%? Strange eh? So we need the income tax to cover Rumpke as they have stated. How on earth are they going to get us to pay for this city in the sky! Let's look at the possible ramifications of this. I am told that this debt will be paid (amortized) over twenty years. TWENTY YEARS!!! 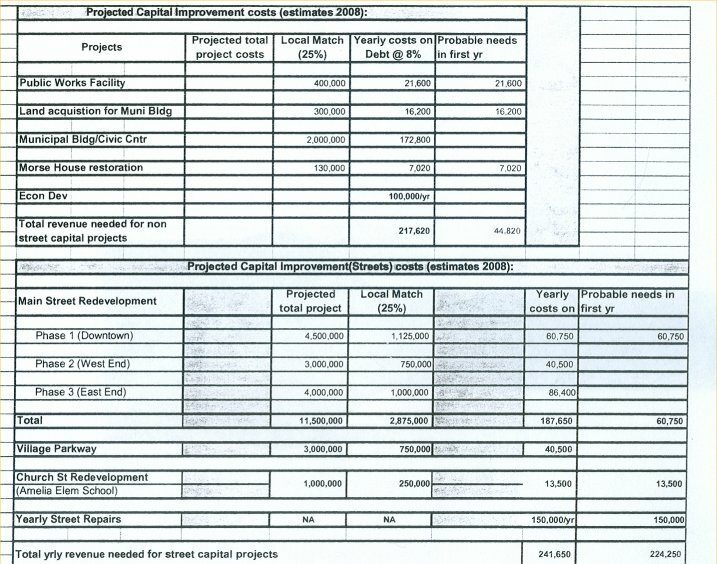 That means the first part, capital improvments, will cost a minimum of $4,352,400.00! And that represents only 25%. What if their scheme backfires and we end up having to pay it all? That would be a debt of $17,409,616.00! Good grief! Thats seventeen million four hundred and nine thousand six hundred and sixteen dollars folks!!! Believe it or not it gets worse! When you look at the Street Cost side of it please don't have a stroke or a heart attack! They virtually want to destroy old Amelia and if you can believe it tear down a great number of houses and buildings and put in a TREE LANE! Believe it or not it gets worse! Included in the street plans is "AMELIA PARKWAY"! Does this make any sense at all? Tear down Main Street and build a tree lane and a bunch of idiotic circles at the end of it. Then build a parkway that bypasses Main Street so that the cars that would normally be coming down Main Street can just fly around all the businesses that are currently on Main Street and go directly to Walmart and all the other businesses that will be built out that way because nobody in their right mind would ever invest in Amelia again. In all likelyhood the small businesses in Amelia will go elsewhere and the people that work there will be out of jobs. Anyone who rents in Amelia will probably leave. THESE ARE REAL RAMIFICATIONS FOLKS!!! And now for the good part. 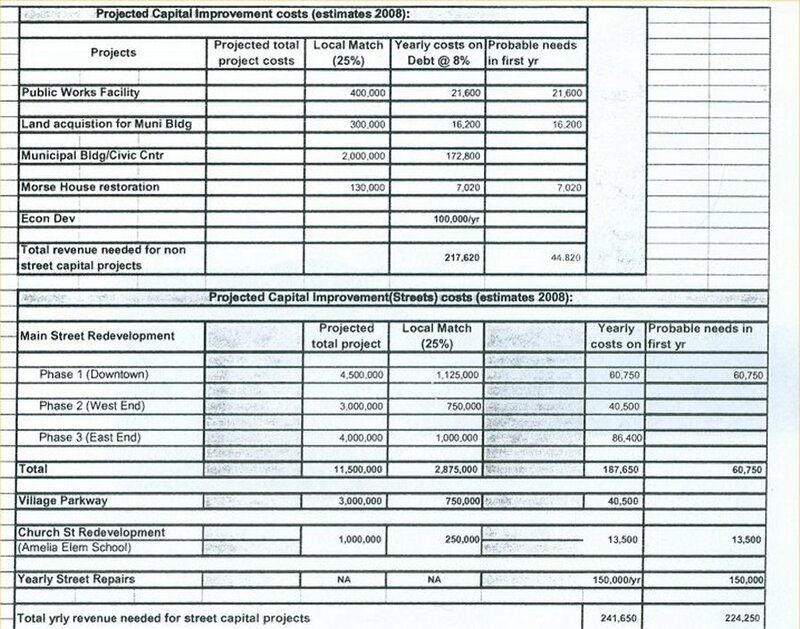 The total costs for this pipe dream is $15,500,000.00! The 25% match is $3,875,000.00! Paid for over the next twenty years at $241,650.00 per year comes to $4,833,000.00!!! I would very much like to tell you what the debt is but by their own admission they don't even know! If their plans fall through and WE have to pay for it all and that would come to $62,000,000.00 or $966600.00 per year!!! At the very least our debt, YOURS AND MINE, will grow from what is already to what it is already plus $459,270.00 per year and that presumes their grandious plans work out! Remember these people are the same people who have already put us into almost enough debt to consider bankruptcy! Do you really want to trust your future to these people and do you really want to pay for this either way? I don't!